I’ve tasted my first tea direct from China, and it seems to make a difference. Back in December, before moving countries and a series of technological catastrophes, the good people at TeaVivre sent me free samples of their tea. After a few emails and reading information about their company, I found them to be a rather refeshing take on the online tea shop. TeaVivre is a group of tea lovers and aficionados from China, Canada and France, who all share a passion for drinking great tea. The name of the company plays on the French phrase, “Joie de vivre”, which means “joy of living”or “enjoyment of life”, and with TeaVivre their aim is to spread the joy of tea online. This group of friends frequently travel through the country visiting China’s tea plantations so they can track down only truly exceptional teas for themselves. They follow a business ethic of honesty and trust, where the relationship and satisfaction of both customers and suppliers is a central focus. And wherever possible, they source 100% organically grown and produced tea. Because they actually visit the tea plantations, they can build relations with their suppliers and verify their growing and production methods and techniques. I find this approach something that is rare to find outside of China. I would think that not many boutique tea vendors outside of China can make the trip more than once a year. Perhaps that’s the difference that I’m tasting in the tea. 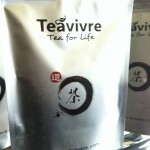 You can buy directly from TeaVivre at www.teavivre.com. Each tea on their website includes a detailed description and reviews from customers. 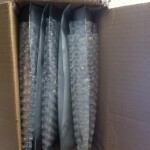 They offer several shipping options to the U.S. The USPS one seems a bit pricey to me if you’re only buying a small amount. My free sample was sent via China Air and it arrived ok, only a slight ding in the box’s corner that didn’t effect the tea itself, but the USPS option is faster. On to the tea itself. 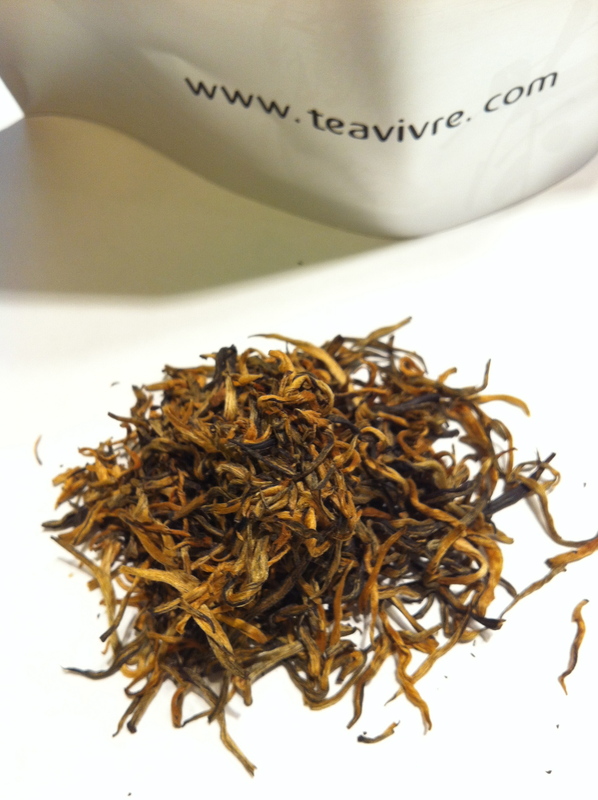 I invited my friend over to help me sample the Yun Nan Dian Hong Black Tea – Golden Tip. According to their website, “Dian Hong black tea, also known as Yunnan black tea, is one of China’s most famous black teas. 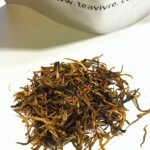 This is the highest grade Dian Hong generally available in China – called Golden Tip Dian Hong. [I haven’t verified that, but I’ll take it at face value.] It has lots of orange pekoe in the dried tea, and brews into an absolutely great tasting, golden coloured tea, with a very rich taste and aroma.” Each bag is vacuumed sealed and I would think helps keep it seem as fresh as the day it was packed. My sample was produced in May (it was December when I brewed it). How do I know? Well, I was surprised to see that their labelling is more detailed than most teas you’ll see in your average tea shop. The label has everything you need to fully appreciate the tea: the place of origin, manufacturer, production date, storage instructions, shelf live and brewing guide. The tea leaves themselves are whole. 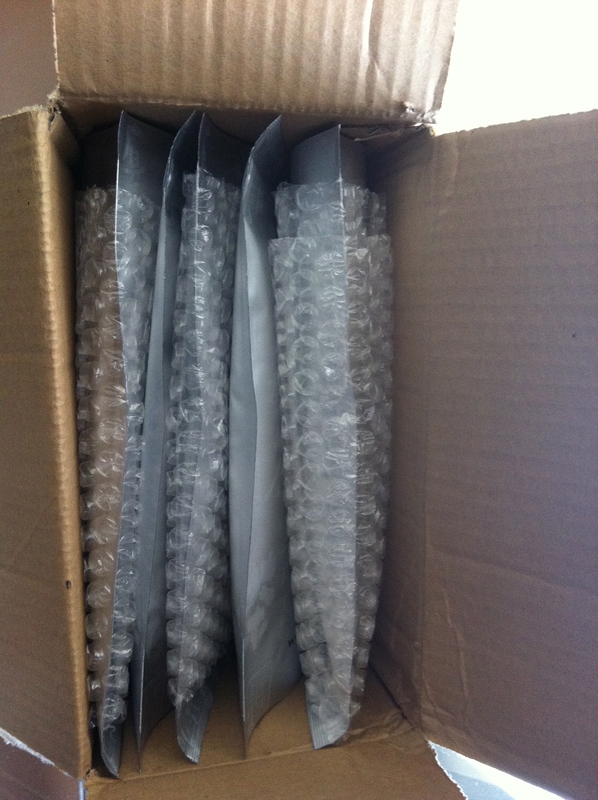 Amazingly there was little to no breakage of the long golden leaves even though it was shipped in a small box across the Pacific (good packing!). The moment I opened the package a sweet hay smell escaped that I attribute to a recently dried green leaf. 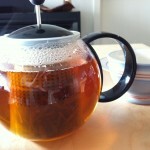 I brewed it following the brewing instructions and in a glass teapot to get a better sense of its color. Very quickly the water turned golden and then to deep amber – for me a sign of a good pekoe. If it weren’t for the tea press in the pot it would have gotten too strong for my tastes sitting in there while drinking a cup, so you might want to brew it in smaller batches if you’re only pouring a cup or two at a time. 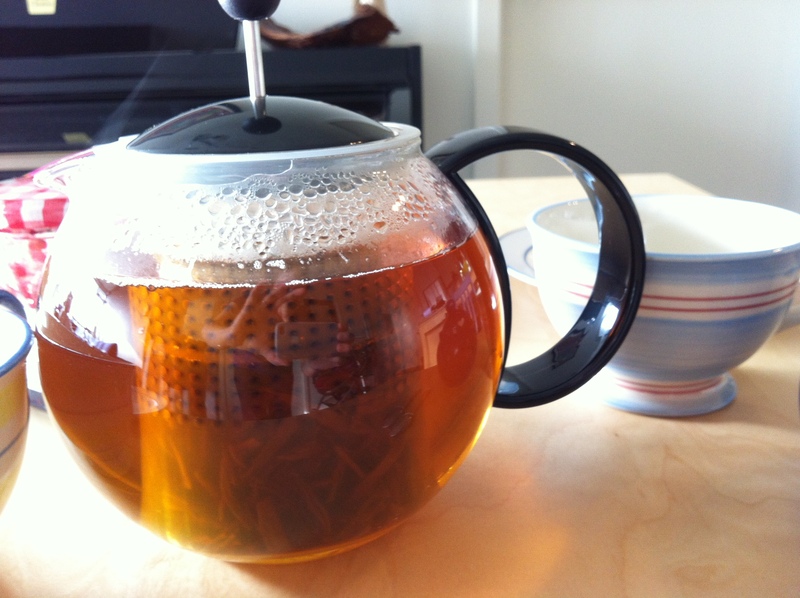 It’s a strong black tea, but it’s smooth with a malty sweetness to it that help to not be overpowering. Also, I felt like my taste buds were tricking me as there was a hint of pepperiness to it. My friends, a tea appreciator but not necessarily a connoisseur, liked it and said it was a good pairing with our scones, raspberry jam and Devonshire cream. I agreed. 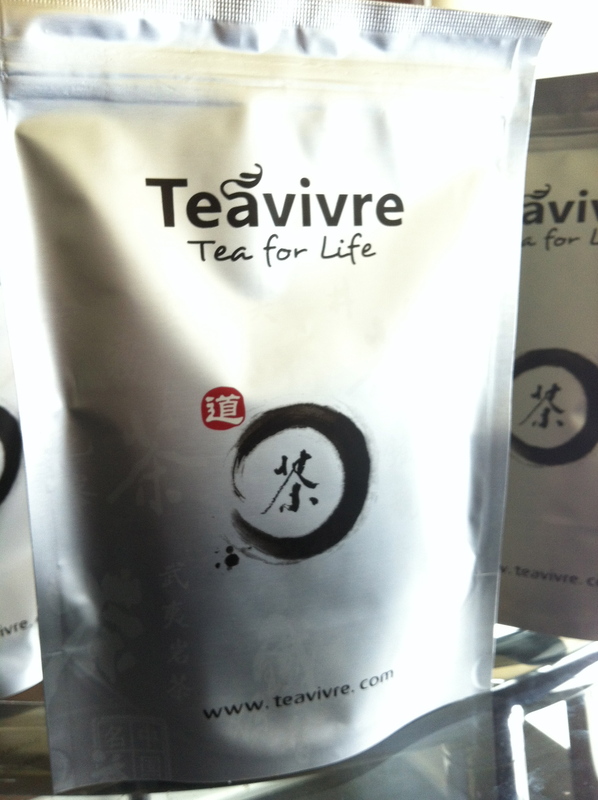 Overall, I highly recommend buying this as your first black tea from TeaVivre.